Tonight is the big night for Our Grand Opening and Holiday Open House Event! 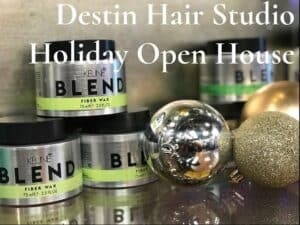 You are invited to a holiday open house to see the new home for our hair salon. We are excited to mingle with you as we show you around our new hair studio. We hope you will celebrate with us, between 5 PM and 8 PM, December 14, 2017. This is a reception style event and is being hosted by our master hairstylist, Kellie Hyer. We will have goodies and giveaways, be sure to join us early so you do not miss any of the excitement. You can check out the fun holiday styles and get some great hair and beauty tips from our hair professionals. We will be serving wine and champagne to our guests. Come mingle and be merry with us as we celebrate our Grand Opening and welcome the Holiday Season with us. Destin Hair Studio has been working hard to provide you with an updated hair salon experience. Our new place is spacious with more stylist chairs and a comfortable indoor and outdoor waiting area. We now have updated equipment for all your hair care needs. We also use and feature only the most trusted products. While you are celebrating with us tonight, you will have a chance to get to know our master hairstylists. We now have the additional space to do bigger parties for our hair salon services and welcome bridal parties and formal events. Ask us about our on-site services. You can get more information on all the new things that we have going on by checking out our previous blog post, Grand Opening and Holiday Open House. Would you like to let us know you will be joining us? You can respond directly to our Facebook Event. Our new hair studio is located next to McGuire’s Pub in Destin Florida. We have included a map to help you find us. We hope to see you there.